When you purchase a new or used vehicle at any Drive Autogroup location, you’ll be automatically entered to win! The contest ends March 15th, 2019 at 6:00 PM EST. 1. 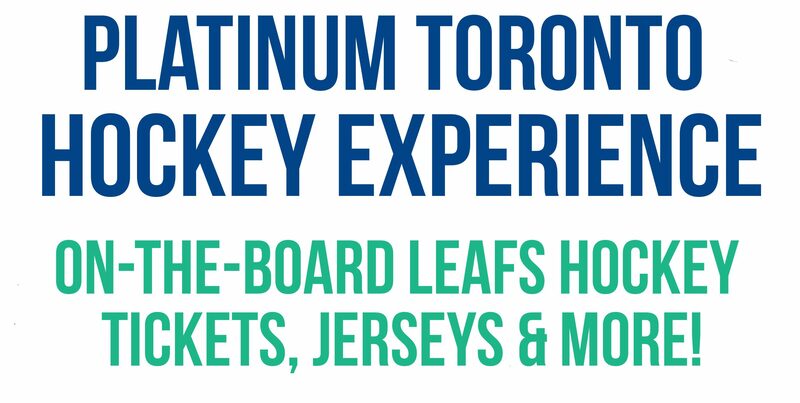 Eligibility: Drive Autogroup’s Platinum Toronto Hockey Experience (the “Platinum Hockey Contest”) is open to those who enter the contest and who are 18 years of age as of the date of entry. The Platinum Hockey Contest is only open to legal residents of Ontario, Canada and is void where prohibited by law. The Platinum Hockey Contests is only open to those who can travel to the Drive Autogroup address and provide valid government identification to confirm their identity in order to claim the “Prize”. Employees of Drive Autogroup (the “Sponsor”) their respective affiliates, subsidiaries, advertising and promotion agencies, suppliers and their immediate family members and/or those living in the same household of each are not eligible to participate in the Platinum Hockey Contest. The Platinum Hockey Contest is subject to all applicable federal, provincial and local laws and regulations. Void where prohibited. Sponsor has the right to verify the eligibility of each entrant. you represent and warrant that you meet the eligibility requirements set forth herein. In addition, you agree to accept the decisions of the Platinum Hockey Contest, as final and binding as it relates to the content. The Platinum Hockey Contest is subject to all applicable federal, provincial and local laws. 3. Platinum Hockey Contest Period: Entries will be accepted online starting on or about Friday, February 15, 2019 and ending Friday, March 15, 2019 @ 6:00 PM EST. All entries (new or pre-owned vehicle deliveries or mail-in ballots) must be received by Friday, March 15, 2019 @ 6:00 PM EST. 4. How to Enter: The Platinum Hockey Contest must be entered by submitting an entry using the method specified in the online post. The entry must fulfil all Platinum Hockey Contest requirements, as specified, to be eligible to win a prize. Entries that are not complete or do not adhere to the rules or specifications may be disqualified at the sole discretion of Drive Autogroup. You may not enter more times than indicated by using multiple ballots, identities or devices in an attempt to circumvent the rules. If you use fraudulent methods or otherwise attempt to circumvent the rules your submission may be removed from eligibility at the sole discretion of Drive Autogroup. 5. Prizes: Winners will receive two (2) Platinum on-the-boards Toronto Maple Leafs Tickets, round-trip limo transportation to the Air Canada Centre and back (the pick-up and drop-off location must be within 100KM radius of the Air Canada Centre in Toronto), $250 that can be used towards food and beverages at the Air Canada Centre and the Toronto Maple Leafs game and two (2) Authentic Toronto Maple Leaf Jerseys/ No cash or other prize substitution permitted except at Sponsor’s discretion. The prize is nontransferable. Any and all prize related expenses, including without limitation any and all federal, provincial, and/or local taxes shall be the sole responsibility of the winner. No substitution of prize or transfer/assignment of prize to others or request for the cash equivalent by winners is permitted. Acceptance of prize constitutes permission for Drive Autogroup. to use winner’s name, likeness, and entry for purposes of advertising and trade without further compensation, unless prohibited by law. 8. Rights Granted by you: By entering this content you understand that Drive Autogroup, anyone acting on behalf of Drive Autogroup, or its respective licensees, successors and assigns will have the right, where permitted by law, without any further notice, review or consent to print, publish, broadcast, distribute, and use, worldwide in any media now known or hereafter in perpetuity and throughout the World, your entry, including, without limitation, the entry and winner’s name, portrait, picture, voice, likeness, image or statements about the Platinum Hockey Contest, and biographical information as news, publicity or information and for trade, advertising, public relations and promotional purposes without any further compensation. Winners will be required to be photographed and videoed by Drive Autogroup during the game and possible periods before the game and after. Winners must sign photo and video release and for use of likeness. Video footage and photographic footage will be used in-store and on digital and social media platforms by Drive Autogroup and affiliate dealerships. Failure to comply with the release for photo and video footage use and use of likeness will result in forfeit of the prize, and a new winner will be selected. transmissions or telephone or Internet service; (iv) unauthorized human intervention in any part of the entry process or the Promotion; (v) electronic or human error which may occur in the administration of the Promotion or the processing of entries. 11. Disputes: THIS PLATINUM HOCKEY CONTEST IS GOVERNED BY THE LAWS OF CANADA AND ONTARIO, WITHOUT RESPECT TO CONFLICT OF LAW DOCTRINES. As a condition of participating in this Platinum Hockey Contest, participant agrees that any and all disputes which cannot be resolved between the parties, and causes of action arising out of or connected with this Platinum Hockey Contest, shall be resolved individually, without resort to any form of class action, exclusively before a court located in Ontario having jurisdiction. Further, in any such dispute, under no circumstances will participant be permitted to obtain awards for, and hereby waives all rights to claim punitive, incidental, or consequential damages, including reasonable attorneys’ fees, other than participant’s actual out-of-pocket expenses (i.e. costs associated with entering this Platinum Hockey Contest ), and participant further waives all rights to have damages multiplied or increased. request along with a stamped, self-addressed envelope to: Drive Autogroup, 1305 Pickering Parkway, Suite 600, Pickering ON, L1V 3P2, CANADA. Requests must be received no later than March 15, 2019. 13. Sponsor: The Sponsor of the Platinum Hockey Contest is Drive Autogroup, 1305 Pickering Parkway, Suite 600, Pickering ON, L1V 3P2, CANADA. 14. You must purchase and have your vehicle delivered between February 15, 2019 and March 15, 2019 to be automatically be entered into the contest to win. Vehicle must be delivered and in possession of the vehicle owner/purchaser by March 15, 2019 6:00 PM EST. 15. Purchase of a vehicle is not required for entry. A ballot can be printed and filled out here. Entry ballots must be mailed to Drive Autogroup at1305 Pickering Parkway, Suite 600, Pickering ON, Canada L1V 3P2 . Limit one entry per household. If you have a question about Drive Autogroup’s Platinum Hockey Contest, please send us a message at care@driveautogroup.ca and we will return your email within 48 business hours.